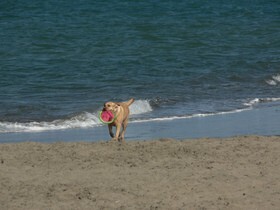 15 Tips For Safe Summer Fun For You And Your Dog! With summer upon us, it’s time to let the kids and pets outside so they can burn off some steam and enjoy the beautiful outdoors. Kids and dogs have a lot in common. They tend to let loose…. running and jumping, going here and there with no thought of what dangers may be present around them. As with your children, your dog’s well-being is your responsibility. That’s why it’s important to keep safety and good health high on your checklist, so summertime will be a fun time for your whole family… including your pets. Be sure to check out each of the linked articles, because there is a wealth of information at each site that will keep your dog happy, healthy, and safe through this hot summer season! #1 Walk or exercise your dog early in the day. Temperatures are cooler in the early morning hours, so try to get outside with your dog before the heat of the summer sun makes exercise too dangerous for you both. #2 Check your dog for ticks. While romping outdoors, your dog is very like to pick up some unwanted hitchhikers. Upon returning indoors, it’s wise to check your dog (and yourself!) throughly for ticks and other bug bites. #3 Some dogs should be shaved, while others should not. I remember as a young lad, when the heat of summer arrived it was time for that buzz haircut. It just made life easier and more comfortable throughout the summer months. The same goes for your dog. Some dogs need relief from their heavy coats, but please be aware that not all dogs are suitable for shaving. Those with double-coats (or undercoats) do NOT need to be shaved. The reason: their undercoat acts as an air conditioner during the summer months. #4 Keep your dog hydrated. To encourage your dog to drink more water, spike his water bowl with a little flavor! For example, add some tuna water or beef broth to his bowl of cool fresh water. The added flavor will have him slurping to the bottom of the bowl. #5 Prevent flies from biting your dog. There are a number of things you can do to stop flies from attacking your dog. Try regular bathing with all-natural shampoos, keeping their food and water bowl area spotless, and removing pet waste from your yard, because that attracts flies by the hordes. #6 Dogs suffer from heat stroke, too. Dogs can quickly become overheated. They cool down by panting, and in extremely hot weather the heat can easily overpower their ability to adjust their body temperature. Familiarize yourself with the signs of heatstroke in dogs and how to avoid it. #7 Yes, dogs do sunburn! Sunscreen formulated for pets is available that will protect your dog’s exposed skin. A dog’s nose is usually the most susceptible area to sunburn. Be sure to provide plenty of shade for your dog, and never leave him exposed to direct sunlight (such as an open kennel with no shade) in the heat of the day. #9 Never leave your dog in the car on a warm day. egrees in just 10 minutes, 29 degrees in 20 minutes, 34 degrees in 30 minutes, and 43 degrees in an hour! #10 Don’t overdo outdoor play time with your dog in the summer. Many dogs are so enthusiastic when it comes to fetching a stick or a ball that they will literally run until they drop from exhaustion. But in hot weather, they may drop from heat stroke before a physical level of exhaustion would normally tell them it was time to rest. #11 Beware of hot pavement underneath your dog’s paws. Sun-baked blacktop can easily fry an egg. Imagine standing barefoot on your stove burner. This is what it’s like for your dog when their unprotected pads reach the surface of a road, parking lot, or even sidewalks. Try to keep your dog off of hot pavement in the heat of the day. 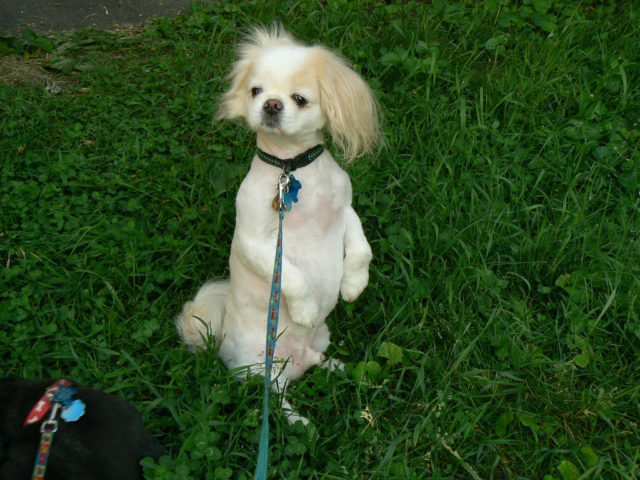 Instead, encourage your dog to walk and play on cool green grass. #12 Provide ways to keep your dog cool. Place a tarp over your dogs kennel to give him a shaded space. Freeze water in 2-liter bottles and place them in your dog’s crate. Cooling mats are available for dogs; some of them contain a crystal material that turns into a gel when wet, allowing them to remain wet and cool for a longer period. Frozen dog treats will keep your dog cool and give your dog something fun to do outdoors on hot summer days. #13 Don’t use a glass dog water bowl outdoors. A glass water dish acts just like a magnifying glass when left in direct sunlight on a wooden surface (like your deck). Just the same, a round bottom bowl placed in a wire rack can concentrate the sun’s rays and cause a fire that could actually burn your house down. #14 Avoid taking our dog to crowed summer events. Taking your dog along to the local festival may sound like fun, but large crowds (and the excitement and confusion they create) can be very stressful for dogs, both physically and emotionally. #15 Never leave your dog unattended around the pool. Not all dogs are good swimmers! Just like a small child, when a dog unexpectedly falls in the water he may not be able to get back out on his own. The sides of the pool typically pose a problem for a dog’s short legs. Summer is a time for fun. It’s also a time to be cautious and conscientious. It’s up to you to watch for health and safety issues that may adversely affect your dog during the hot summer months. Signs of heat exhaustion include: red gums, excessive panting, looking tired, dehydration, and excessive thirst. Cool your dog off with a spray of water or cool towels on his head and chest, and give him plenty of water. Signs of heat stroke include: pale gums, lethargy, extreme dehydration, and a very high temperature. This is an emergency! Take your dog to a veterinarian immediately. 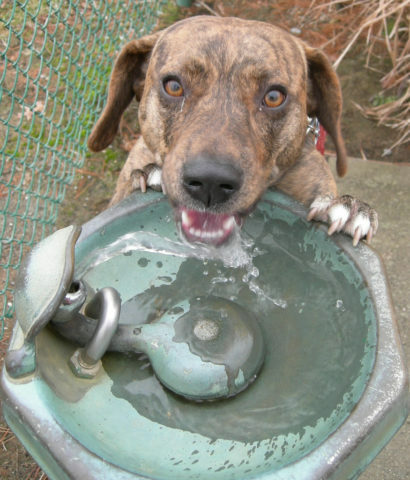 Yes, Dogs Can Drink TOO Much Water!